In 6-quart Dutch oven, cook bacon over medium-high heat 3 to 5 minutes, stirring frequently, until crisp. Drain on paper towels; set aside. Wipe excess drippings from Dutch oven. Add pork; cook 3 to 5 minutes or until edges are light brown. Remove pork; set aside. Drain any liquid from Dutch oven. Add beef; cook 2 to 4 minutes or until edges change color. Remove beef; set aside. In same Dutch oven, heat oil over medium-high heat. Add sausage; cook 4 minutes, stirring occasionally. Stir in onions and garlic; cook 2 to 3 minutes. Return bacon, pork, beef and sausage to Dutch oven. Stir in beans, tomatoes, broth, pepper flakes and bay leaves. Heat to boiling. Cover; simmer about 1 hour or until meats are tender. Remove bay leaves. Serve stew with rice; garnish with parsley. If you have a Latin market nearby, buy dried meat. In Brazil, they also use it. Have extra ham? Stir it in! 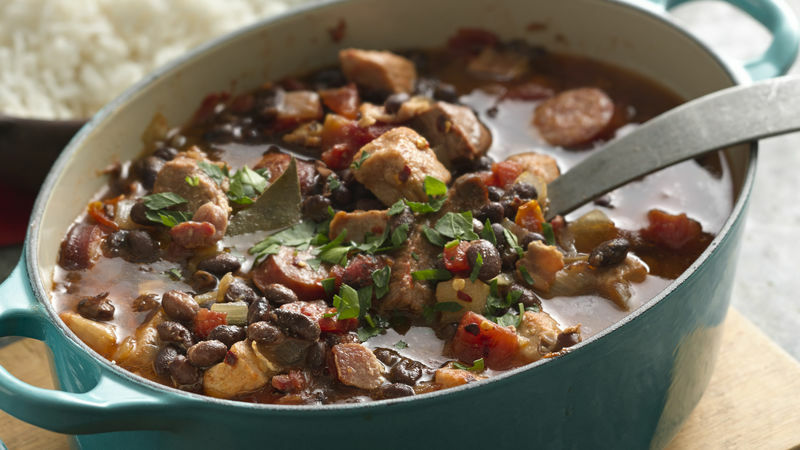 Enjoy our version of Feijoada—a hearty Black Bean Stew directly from Brazil. It's the national dish!